Sounds good, right? Up to 40 games a week. Some might be blacked out, but only games which are out of market. What does “stream live out-of-market games” mean? The NFL considers a market a major U.S. city. This is evident in their blackout policy for home games which are not sold out. For example, I live in Cincinnati. When our homes games don’t sell out, the NFL blacks out the game in our market. Let me tell you what NHL Gamecenter means by “out of market“. They mean that if any network is showing a game on TV in the U.S. or Canada you will not get this game. If it’s shown on Hockey Night in Canada on the CBC, you cannot get this game. Nevermind if you live in Canada or not. Canada is considered “in market“. If games are shown on Versus or any other network anywhere in the United States, you cannot watch the game. If you live on the East Coast, this means that West Coast games because those are considered “in market” if they’re on anything but a local TV station somewhere in the United States. Same for East Coast games if you live on the West Coast. So on any given night during the regular season, there are typically 1-2 games which you can’t watch. Usually the best match-ups. Now I could live with that. Here’s what gets me. ALL PLAYOFF games are televised. This means NO PLAYOFF GAMES are televised on NHL Gamecenter. None. Zero. Nada. Zilch. Now NHL Gamecenter doesn’t tell you this when you sign up. You find out out about it when you’re all excited that the playoffs are starting and you turn on your ROKU and try to find a game and none of them are available. Then you call customer service and the first message you hear is that ALL PLAYOFF GAMES ARE BLACKED OUT. I would never have bought NHL Gamecenter if I’d of known this. So I contacted customer support to ask for a refund of my final month’s payment (the final playoff month). The playoffs are included, but blacked out for the U.S. and Canada. Correct me if I’m wrong, but the NHL only has U.S. and Canadian teams. Translation: How the f*ck can they be included if they’re not included in U.S. and Canada? Here is most of my conversation with Customer Support. Long story short: This service is a complete RIPOFF. If you are thinking about this, it is not worth it. You might as well spend the $160 at a bar watching games. Because you’re going to have to anyways. Unfortunately we are unable to cancel your account at this time. Each subscriber has 5 days to cancel from the day the package was ordered or activated, as agreed upon in the Terms and Conditions. Your activation date was on . The day it was activated counts as one of the 5 days. Your purchase was for the Full Season, but you chose to pay it off in 8 “Monthly Installments”. The NHL does not offer a month to month service that can be canceled at any time, just the full season with the option to pay it in full upfront, or to pay it off on monthly installments. We encourage you to take advantage of your purchase and enjoy the rest of this NHL season. You have been removed from the automatic renewal for the 2012/2013 Season for GameCenter Live, so your account will cancel after your last payment. We hope you enjoy your service with NHL.com. I’d like to enjoy the rest of the NHL season. 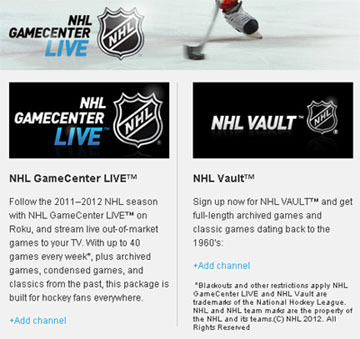 Unfortunately, NHL GameCenter, I can’t on your network because you offer such a horrible ripoff of a service. Agreed! I just went through this same painful process as you. What a complete waste of time and money. I can’t imagine anyone being happy with this service. They may have screwed a few people over this year but there’s no way they’re getting repeats for next year. They’ll have to hope on a brand new batch of people to take advantage of. Everything you said is spot on. The whole “out of market” thing is ridiculous. For $160 you should get to see any game, any time. I hope more people find this review and are not suckered in next year! Here here. Apparently there tech service people were deluged with calls. They’ve lost me as a customer for next year. I’d rather listen to games online on the radio than pay for another year of Gamecenter. I stumbled upon this thread as I was checking Google for NHL’s intentions for European GCL availability next season, and had to laugh, as your experience is the opposite of what I’ve had this season with Gamecenter Live in the UK. We had the situation last year, just before the start of the season, that ESPN went real quiet about the NHL TV scedule, and they told us nothing about losing the NHL and even after the season openers were saying they were still hopeful etc……BS. So I looked at GCL and signed up as soon as it went live here (after the European openers I think…), and was very pleased. We don’t get any blackouts – I could watch live, and can still replay every single game of the season and playoffs. For added value, most games are available from both teams’ broadcast feeds. During the playoffs this changed to a choice of usually NBC or whichever Canadian broadcast. I pay the same subscription in $ as you, about £13p/m but it goes up and down a little. I’m just shocked that we have it better here than you do. That’s really opened my eyes. Agreed. Don’t buy Gamecenter until the NHL changes its blackout rules. I can’t tell you how many times I was looking forward to watching a game and discovered it was ‘blacked out’. Technically, it’s fine. The product basically consists of the leftovers – all the games left over after the networks are through taking their cut. Also – beware that your subscription AUTOMATICALLY RENEWS ITSELF and you only have 5 days to cancel. So, if you are not paying attention to email, you could end up with Gamecenter for another year without recourse. If you had Gamecenter last year – call customer service NOW to take yourself off of automatic renewal (you need to call them, there is no option available in your profile). Too bad. This could be a good service. Remember, all nationally televised games (In US: NBC, NBC Sports Network or NHL Network; In Canada: CBC, NHL Network, RDS or TSN) are not available to watch live in NHL GameCenter LIVE™. If you are in the US, Canadian games aren’t nationally televised. National broadcasts may include games televised on the following networks in your area: CBC, NBC, NBC Sports Network, NHL Network, RDS and TSN. Notice it says “networks in your area”. No Canadian network would be in your area as they would not be broadcast on any provider within a US zip code. And the playoffs followed exactly what you should have read on the blackout. If it is broadcast on a national network, and NBC, NBCSN, CNBC, and NHL are national networks the last I checked, it would not be broadcast on Gamecenter. What you are reading is a remnant of 2011 and prior where the first round was not entirely broadcast. I believe you make my point for me: the advertising is deceiving. Even after reading the fine print it’s not clear that you basically get NO live games because somewhere, someone is televising one of these. I dropped the service and am spending my saved money at bars.